Baby Toys Cellophane Roll 24 inches wide x 50 ft long. 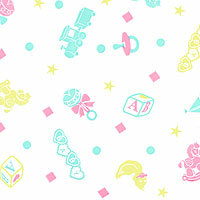 Cute pink, robin egg blue and yellow toy images of trains, rattles, yellow duckies, hearts, blocks, squares and stars. Great for baby boy or girl shower or welcome gift. Cello background is clear.